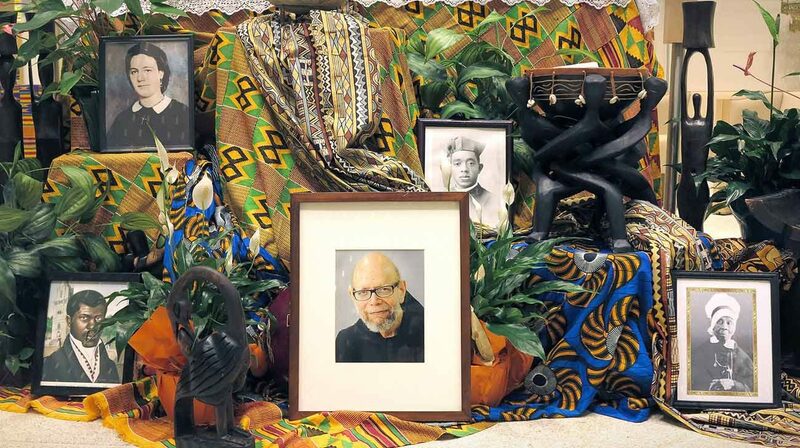 UPDATED – NEW ORLEANS (CNS) — Reynold Verret, president of Xavier University of Louisiana, announced July 31 that the university and its Institute for Black Catholic Studies will become the new hub for the advancement of sainthood causes of African-American Catholics. — Father Jordan also talked about Father Tolton, a former slave from Missouri whose family used the Underground Railroad to find freedom in Illinois. He trained for the priesthood in Rome because he was refused entrance into American seminaries and was ordained in 1886. He suffered threats while pastoring in his Illinois hometown and moved to Chicago to found St. Monica’s, the city’s first black parish. “His life was a life of courage,” Father Jordan said. The cause for his canonization was proclaimed in 2011. He was named a “servant of God” in 2012. The Vatican Congregation for Saints’ Causes declared affirmatively to the validity of the inquiry into his life in 2015. His remains were exhumed in 2016, and his “positio” was approved so his cause can move forward to the pope. — Sister Magdala Gilbert, an Oblate Sister of Providence, discussed Mother Mary Elizabeth Lange, her order’s founder and a “servant of God.” Sister Gilbert described her “as a no-nonsense woman who did what she had to do.” She worked to educate African-American children when it wasn’t popular: “When you have God at your side, you fear nothing.” Mother Lange’s cause began in 1991 but was recently assigned a new postulator in hopes that the “positio,” or position paper, on her life will be completed this October. — Sister Greta Jupiter, a member of the Sisters of the Holy Family, talked about the cause of Mother Henriette Delille, who founded the order in 1842. She was declared “venerable” in 2010 by Pope Benedict XVI. Two miracles attributed to her intercession are being examined. In general, one authenticated miracle is required for beatification and a second such miracle for canonization. — Mary Leising described the Denver Archdiocese’s progress made on the cause of “Angel of Charity” Julia Greeley of Colorado. Born in Hannibal, Missouri, she worked and walked the streets of Denver collecting food, coal, clothing in a little red wagon and delivered the goods at night to the needy. She joined the Secular Franciscan Order in 1901. A guild to research her sainthood was established in 2011. Her cause was opened by Denver Archbishop Samuel J. Aquilla in 2016. On Aug. 10, the archdiocese will close its investigative phase and send its findings to Rome. Xavier University was the last stop on the conference’s Black Catholic Enrichment Tour that treated attendees to significant sites in the life of African-Americans in New Orleans. The conference celebrated the 50th anniversary of the National Black Catholic Clergy Caucus and the National Black Sisters Conference and their formation of strong black Catholic men and women of service. “Welcome. You are standing on holy ground” were the first words tour participants heard when entering St. Augustine Church, founded in 1841, in New Orleans’ historic Treme’ neighborhood. Local conference committee member Jari Honora and New Orleans Auxiliary Bishop Fernand J. Cheri explained that St. Augustine Church saw whites, free people of color and slaves worshipping together. Along the route, Bishop Cheri referenced Congo Square as a place where free people of color congregated, the Mahalia Jackson Performing Arts Center (named after the New Orleans-born gospel singer) and how native Louis Armstrong was baptized Catholic at Sacred Heart of Jesus Church on Canal Street. When passing Corpus Christi-Epiphany Church, which merged after Hurricane Katrina, Corpus Christi Parish, founded in 1916, was noted as once being the largest African-American parish in the world and was considered “Queen of the Josephite missions.” Bishop Cheri recalled there being about 53 majority-black parishes in New Orleans; now, the number is close to 24 parishes and three predominantly black schools. 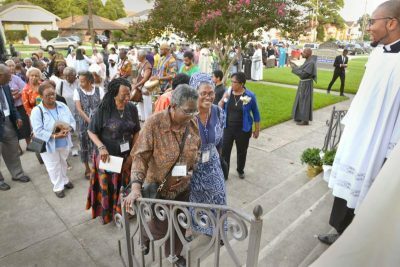 At the Sisters of the Holy Family Motherhouse in Gentilly, Sister Laura Mercier said when her order’s founder is canonized, she would be the first native-born African-American saint. “Her life will be a reminder that everyone can be a saint, no matter what color they are,” Sister Laura said.